« What Would You Be? Looking for the Wednesday Wandering? Page back one and learn about a special quiz you can take to find out where you might have fit in on the planet Artemis. Then join me and Alan as we continue chatting about misconceptions of climate. JANE: Alan, last time you asked about hail here in desert New Mexico. I won’t go into the technicalities, but we usually get hail as a result of sudden shifts of temperature. 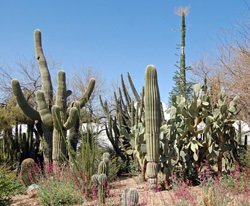 Although people persist in thinking New Mexico is Arizona – a situation not helped by movie Westerns that mention New Mexico locations and then show saguaro cacti as part of the landscape – New Mexico has a very different climate. ALAN: Are saguaro those the cliché cacti that we always see in cartoons? The tall ones with U-shaped arms growing out of the sides? What do they have to do with whether or not you are in New Mexico or Arizona? I thought the difference was just an arbitrary line on a map. JANE: Saguaro actually grow in a very limited range – and New Mexico isn’t within that range. Consequently, if you see saguaro, even if the movie tells you the story is set in New Mexico, it’s not. Jim and I had our suspension of disbelief seriously bruised a few weeks ago when we were watching a Western where the action was supposed to take place largely around Santa Fe and there were all these saguaro. Well, actually, we’d already been talking to the screen a lot because of how quickly the characters got between towns that are actually hundreds of miles apart. But, I am getting off topic. ALAN: That’s why we call these discussions “tangents.” So you’re allowed. JANE: What a relief! Anyhow, what I was going to say is that most of New Mexico is blessed – or cursed, depending on how you feel about it – with four seasons. Temperatures get well below freezing in winter, and if we don’t get snow it’s not because of lack of cold, it’s because of lack of moisture. What are winters like in New Zealand? Sorry – I exaggerate for dramatic effect. Early spring and late autumn tend to shade imperceptibly into and out of winter and it’s hard to know when each begins and ends. However, late spring and summer do tend to be very pleasant, and winter, of course, is quite the reverse. JANE: When Roger and I were in New Zealand, the weather was perfect. That was April, I believe, so your early autumn, right? ALAN: Late autumn, shading into winter. You were lucky. Though having said that, this year has been rather similar to what you experienced. First time for a long time, though. JANE: Late autumn? I remember roses… We were lucky. You’re originally from England. How does the weather in New Zealand compare with the weather in England? Did you like the change? ALAN: It’s broadly similar, though in some respects a little gentler. I was pleased to find that by and large snow is very well behaved here. It stays on the tops of mountains so that people can ski on it instead of invading the towns and causing much disruption. Of course there are always exceptions to every rule and the South Island towns regularly get a lot of snow in the winter, particularly down near the bottom, which is worryingly close to Antarctica. But, here in Wellington, snow is unheard of except once, a couple of years ago when, for the first time in living memory, snow actually fell down to sea level and Wellington seized up, descended into total chaos and then came to a standstill. JANE: I’ve lived much of my life in places that don’t handle snow well at all. However, on the whole, I like how it happens in Albuquerque. We get snow. People run outside and build snowmen; the kids get a delayed opening at school or even a day off; then over the next few days the snow melts. There are none of the ice banks turning into grey slush and ice that I remember less than fondly from D.C. and New York City. Of course, that’s just Albuquerque. I won’t attempt to speak for the rest of the state. It sounds as if you don’t miss the snows of your Yorkshire childhood. ALAN: If I never see snow again, I’ll be very happy. When I was a child, we lived in a village which was on the top of a hill. The big town where I went to school was down in the valley. It was not uncommon for me to go to school in the morning, watch the snow fall all day long, and then find that the village was cut off and I couldn’t get home. JANE: Gosh – what did you do? Build a snow hut and burn your school books for warmth? ALAN: Stayed with friends usually. Though on a couple of occasions I did walk home, battling my way uphill through snow drifts and eventually arriving home exhausted, soaking wet and freezing cold. JANE: It’s a pity you never had children. You could have annoyed them with stories about how you slogged home with drifts up to your waist, and made snarky comments about how children these days are too soft. Reminds me of a lovely one panel cartoon I saw many years ago. It was a Family Circus, if I recall correctly. The father and elder son are out walking in the snow. The father says, “When I was a boy, we got so much snow that it came up over my knees.” The boy is glancing down and, of course, the snow is up over his knees… Ah, sweet memory! Surely you must have some good memories about snow in England? It always looks so picturesque on greeting cards. ALAN: It can have its moments. My dog was always thrilled when the snow first appeared and he’d run around gleefully with his nose close to the ground, ploughing it all up. When he eventually came back he’d have a huge grin of pleasure all over his face, his thrashing tail propelling him forwards. And there would be a cute little pyramid of snow balanced on the top of his nose. He’d go cross-eyed trying to stare at it. JANE: We didn’t have dogs or cats when I was a kid. My cats are indoor cats, so they don’t go out in the snow, but when we do get snow, they spend a lot of time staring out the window, trying to figure out who spilled all that white stuff on the landscape. They really enjoy watching the birds foraging. JANE: Wow! Was anybody in it? ALAN: No, it was just parked in its normal place. Usually they’d have walked around it of course. But this time, because they couldn’t see it, they’d just absent-mindedly walked up what they’d assumed was just another snowdrift. ALAN: But perhaps the most dramatic thing I remember was waking up one morning and opening the back door to let the dog out. But all I could see was a curtain of white with a ghostly glow of sunshine diffused through it. Overnight the snow had drifted up, completely covered the side of the house, and then frozen solid. I actually had to punch my way through it to reach the outside. Fortunately it wasn’t very thick. This entry was posted on July 17, 2014 at 1:00 am and is filed under Thursday Tangents. You can follow any responses to this entry through the RSS 2.0 feed. You can leave a response, or trackback from your own site. I like four seasons too. Lately here in Virginia, spring and fall have been truncated, leaving winter (much snow last year) and summer (hot!). But these things keep changing, so maybe we’ll get back to four. Four seasons are fun, but it’s equally fun to live in a place that doesn’t have four seasons and watch people warp the four seasons around to try and fit here. Southern California arguably has two seasons or five. The two season model is fairly simple: the rainy season and the dry season, as in much of the world. The five season model is winter, spring, summer, fire, and fall. Of course, no one likes either of these, although the meteorologists do (quite properly) talk about the rainy season here. But they also talk about winter, spring, summer, and fall, with summer starting Memorial Day (last weekend in May) and ending on Labor Day (first weekend in September), so it really has little to do with the astronomical summer. Still, people come here from elsewhere and frump about how they’re so much tougher because they come here from winter country where they had to deal with snow. Similarly, in the Midwest, I was told that the summers were worse there than in LA because of the humidity (my rejoinder was: really? 90 and humid beats 120 and smoggy?). In general, I’ve had to gently educate the immigrants that, just because a season doesn’t grab your attention by trying to freeze you to death or keeping you from sleeping well for a few weeks, it doesn’t mean it doesn’t exist. In the milder years, one has to pay attention to notice that the seasons have changed in Southern California. There’s little of this garish drop all the leaves and freeze all the sidewalks stuff to force you to pay attention when you’ve got other things on your mind. One thing we really didn’t get into is that here in New Mexico we get monsoon rains. Most of our rain fall comes in late June, July, with smatterings in August and a bit in mid-September. We can — and do — go for months without seeing a drop. We have new neighbors who happened to move in during the first good summer monsoon season we’ve had in about five years. I want to get to know them so I can gently warn them that this won’t last and if they want to keep the handkerchief lawn they purchased with the house, diligent watering will be needed. From the comments that have drifted over the back fence, clearly they don’t have a clue.